Flanked by administration officials, President Barack Obama announces Chryslers bankruptcy filing at the White House last week. 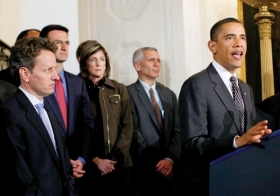 From left: Treasury Secretary Tim Geithner; Peter Orszag, director of the Office of Management and Budget; Carol Browner, director of the White House Office of Energy and Climate Change; and Jared Bernstein, chief economist to Vice President Joe Biden. DETROIT — Chrysler LLC's shutting of its plants until it emerges from bankruptcy couldn't come at a worse time for parts suppliers. Already reeling from General Motors' impending nine-week production shutdown this summer, which starts today, May 4, at some plants, suppliers are threatened with a nuclear winter of lost business over the next two months. They may be forced to seek help from other customers to survive. The revenue drop will hit suppliers quickly, said Neil De Koker, president of the Original Equipment Suppliers Association. "We're so far below our breakeven capacity utilization that we're just bleeding money," De Koker said. "The question is: How much more can we bleed to get through this? A lot of suppliers will not be OK."
One executive for a major supplier, who asked not to be named, said that most have cut costs already; the next step will be more layoffs and plant shutdowns. Plants dedicated to Chrysler will be the first to close, he said. "More complex issues surround facilities that supply multiple customers," he said. He also is skeptical about Chrysler's plan to emerge from bankruptcy and resume operations in 30 to 60 days. A longer shutdown could delay Chrysler's model-year changeover. All Chrysler U.S. assembly plants were scheduled to halt production from today until a new Chrysler emerges in 30 to 60 days in partnership with Fiat S.p.A., the company said. Canadian and Mexican plants were scheduled to stay open. Several Tier 1 suppliers stopped shipping to Chrysler until they could find out whether they would be paid during Chapter 11 proceedings, De Koker said. On Thursday, April 30, Chrysler's Sterling Heights, Mich., plant halted production when it ran out of key parts. It builds the Chrysler Sebring and Dodge Avenger. The next day, Chrysler's two Canadian plants — Windsor, which build minivans, and Brampton, which builds the Chrysler 300 and Dodge Charger and Challenger — stopped because of a lack of parts. In a motion during the first day of bankruptcy court pleadings on Friday, May 1, Chrysler asked court permission to pay some select "essential" suppliers right away for bills that normally would be locked in bankruptcy court for weeks or months. It also asked that payments to some suppliers that shipped parts in the last 20 days be treated as "administrative claims," thereby pushing them toward the front of the queue for payment. Both requests are subject to the bankruptcy judge's approval. Chrysler, which in a conference call encouraged its vendors to believe that all would be paid, also is counting on government funds. 1. By paying a fee to the government totaling 2 percent of the amount they are owed by the automaker, suppliers can secure a government guarantee of the funds owed. They then can use that guarantee to back a loan request to a private lender. 2. They can pay a 3 percent fee and the government will pay them the amount owed immediately. Then the automaker will pay the government. If Chrysler is unable to get approval to pay certain suppliers, they would be unsecured creditors. Historically, unsecured-creditor suppliers get paid 16 to 20 cents on the dollar in a bankruptcy case, De Koker said. Thus, payments for parts shipped before the filing are at risk. In its filings, Chrysler said it paid $25.9 billion for production parts last year and currently has $5.7 billion in unpaid invoices, including $1.7 billion to production parts suppliers. Suppliers may survive the Chrysler bankruptcy and GM's shutdowns this year by cutting employees and halting raw material buys to save cash. But in a court affidavit, Chrysler purchasing chief Scott Garberding said that restarting Chrysler poses risks to suppliers that won't have their regular source of revenue to fund operations until they are paid 45 days later. Industry experts say cash-strapped suppliers are pressing GM and Ford Motor Co. for assistance. Ford already is aiding its suppliers, Mark Fields, Ford's president of the Americas, told Automotive News, including "financial support where it makes sense for us to do so."